Construction Gantt chart templates are quite useful for construction project management for different usages from government to commercial buildings. Easily refer to this article for more free download editable Gantt chart templates and the way to personalize them. 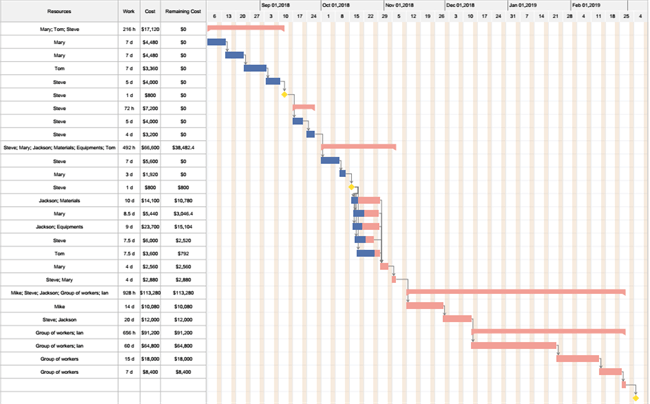 What is a Construction Gantt Chart? How to Customize a Construction Gantt Chart Template? 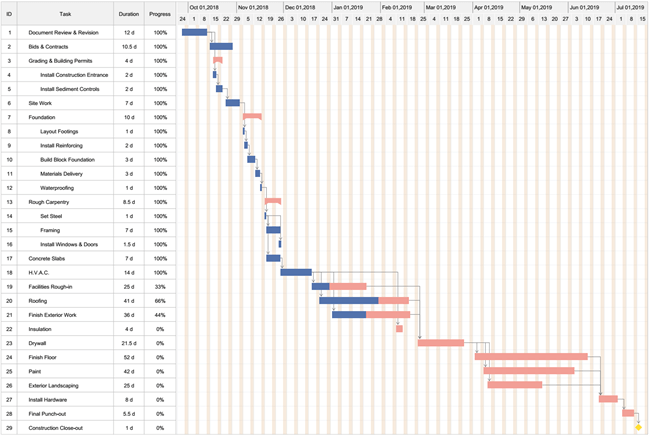 Construction Gantt charts are formed by visual colored-bars to show breakdown individual tasks within a given time period. Time sequence is presented on the horizontal axis, while the vertical axisdisplays all the tasks progress. 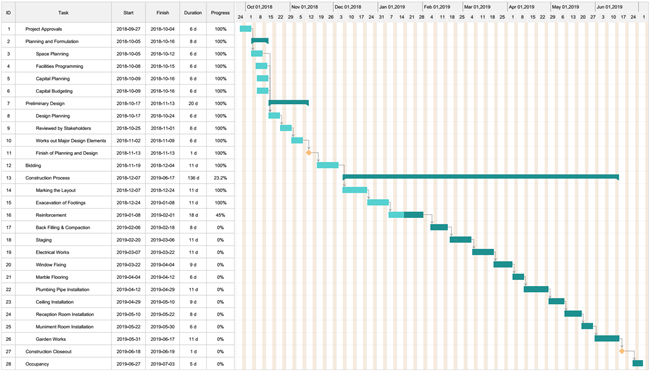 Construction Gantt charts are often used by project managers to do a series of actions such as setting task relationships, adding milestones, and managing team resources etc. This mainly refers to public and buildings including agricultural facilities, water supply channels, government office buildings, universities, hospitals, civil activities center and so on. Here is a template of a government building construction Gantt chart with all the basic construction steps. You can click on it to see more details. This type normally includes the facitilies in our daily life like houses, home buildings, apartments and more. The template below lists all the key things you need to do to set up your house. Check out more insights by hitting on the template. This category is for the uses of business, commerce, international trade, customer services and so on. Examples can be hotels, shopping centers, private financial and agencies etc. This commercial building construction Gantt chart template helps illustrate the progress of tasks by visually highlighting in different colors. 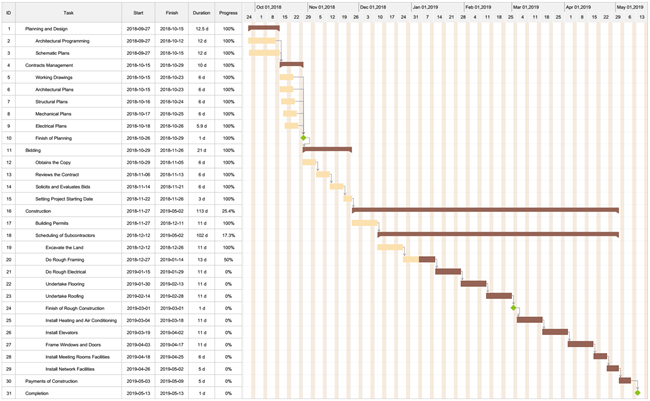 The Gantt chart template here specifically shows the interior design process of a typical construction project. It can be used for all the three main categories as mentioned above: government, commercial and residential. This construction Gantt chart template here offers you a more detailed Gantt chart project management options including highlighting task priority, managing resources, calculating working days and hours, monitoring remaining cost and so on. Click it to see more. Feel free to explore more Gantt chart templates as shown below in a wide range of fields: software or product development, event planning, business and marketing strategy and more. Click on the chart or the text below to free download and customize the template. You can do so by setting task starting and finishing date/hours, working days, time unit, and date format etc. The time column for each task will be calculated automatically. You can also indent/outdent separate tasks, insert colorful task priority labels, or build sequence links between different tasks. You can do so by defining resources name, unit, type, standard rate, overtime rate, group No., member e-mail, and so on. Alternatively, you can update the progress bar to track your tasks. Feel free to try different Gantt chart themes with the help of the auto tool to switch between display options. You can also see a series of auto-create reports based on your existing construction Gantt chart in much more details including cost and working hours. Besides, when you need to present your Gantt chart for a meeting, simply print it or export to the PDF format. Edraw Project is an easy-to-use tool with professional and visually appealing preset Gantt chart templates that makes construction project management more easier than Excel. You can keep details organized by inserting hyperlinks, generating cost reports and managing team resources. Empower your construction project with Edraw Project right now by clicking on the Free Download button at the end of this page.